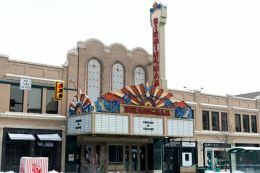 Built in 1927 as a single screen movie house, and was rebuilt and restored in 1996 as an 8-screen multiplex theater called the Birmingham 8 (Uptown Entertainment). Sold to Bill Herting of Birmingham Theatre, LLC., effective July 1, 2015. The Marquee > Search > Owner/Operator > Birmingham Theatre, LLC. This movie theater is near Birmingham, Troy, Bloomfield Township, Bloomfld Twp, Bloomfld Hls, Bloomfield Hills, Bloomfield, Bloomfield Twp, Bingham Farms, Royal Oak, Beverly Hills.